Iran – with 1,640,000 square kilometers area, in the south-west of Asia- of the northern hemisphere, has its specific combination of different elements of life and a special ecosystem and biodiversity due to various factors including different climatic conditions, high mountains all around and a large desert in center. Different phytogeographic regions in Iran’s plateau cause massive genetic flow in this area which result in a variety of plant species and in comparison with neighbor countries and some others has very interesting points. Some plant species have been walled beyond the natural fences (as endemic), and some are scattered in other lands. Most part of Iran is occupied by Deserts and semi-deserts. Residents of these areas have always been strongly dependent on vegetation cover, and where the vegetation cover could create good micro-climate, people have settled there. Due to the diversity of climate, topography and edaphic conditions, limited areas of vegetation in Iran, are very different and heterogenous. Due to social, economic and cultural reasons, indigenous and non-indigenous residents of these regions, consciously or unconsciously have exploited from these natural resources excessively. This process made a gradual destroying of pastures, forests and vegetation of Iran and made the vegetation areas smaller and poorer, and made the deserts bigger. The current situation of vegetation is vital and critical for Iran. And now it feels that rational utilization and protection of vegetation are vital needs. Areas with severe damage in vegetation, should be considered and need some serious protection to keep the remaining species. Some of these plans consist of culturing of reproducable plant species, study of the causes of the extinction of extinct species, searching, finding and protecting of rare and endangered species. 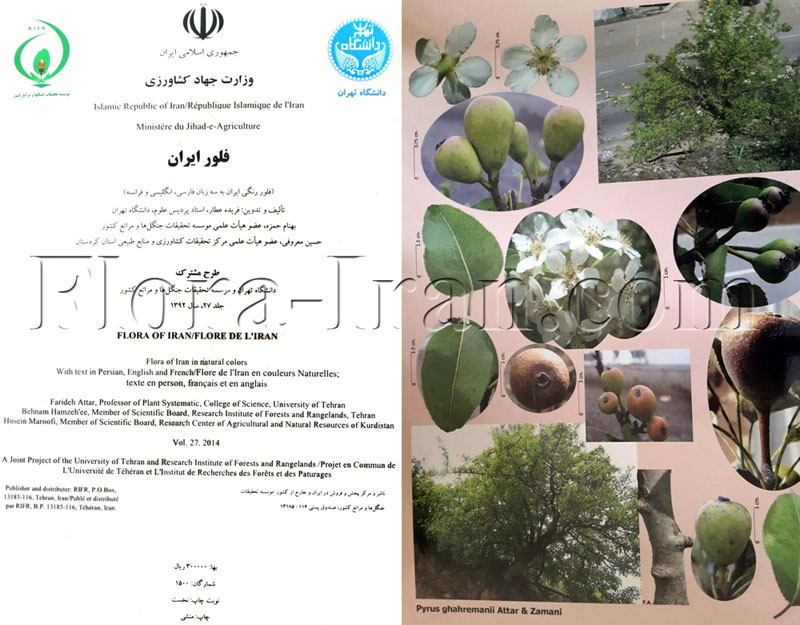 Some aims of this site are: broadcasting the current situation of plants in Iran, clarifying the critical points, such as rare plants, endangered and endemic species. Vegetation in Iran, in particular, consists of discrete and dispersed limited areas. Its coverage in the northern and northwestern areas and humid regions is very high, but in arid areas with low precipitation and high evaporation is very low. However, there is very high plant diversity in Iran which is remarkable and comparable with other countries. Iran consists of 167 families of vascular plants, 1215 genera, some of them only by one species and some of them by about 800 species (Astragalus). – Ghahreman, A. & Attar, F. (2000): Biodiversity of plant species in Iran, vol. 1. Tehran University publications.